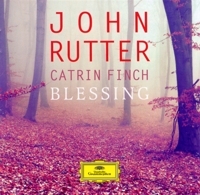 This "Celtic" collaboration between Catrin Finch and John Rutter includes the premier recordings of evocative pieces written or arranged by John Rutter for the virtuoso Welsh harpist, as well as Catrin Finch's own delightful Celtic Concerto. The greatest privilege for a musician such as myself is the opportunity to create and record wonderful music with fellow musicians and composers. I first met John one afternoon at a London hotel where we sat down for a cup of tea to discuss the possibility of his writing a work for me. Out of this conversation came the Suite Lyrique, which I performed shortly afterwards. It became obvious that we should record it and so I approached DG with the idea. We were overjoyed that they were keen to get involved. So this CD was born. The music is a collection of some of John's more popular works, some traditional Welsh folk songs, two wonderful lullabies for my girls, and the Suite Lyrique. As we were discussing and preparing the recording, I had started work on a small concerto for harp and strings. It was the first time I had put pen to paper, as it were, and written some music down properly. I was naturally very excited when it was decided to include this work as well - the Celtic Concerto. There is always a whole army of people who help along the way to make projects like this happen. But, to name just a few ... Thanks to John for all his work and musical inspiration; Elin for her sublime singing; Sinfonia Cymru for providing the fabulous young players that made up the strings and woodwind; Geraint and Elinor for their constant support and friendship; Lou Watson - finally the duet we were waiting for; the studio team for their engineering skills and making it all sound beautiful; and my family, who keep me pulsing on! My love of the harp was kindled at an early age. As a boy soprano I sang in a local performance of Benjamin Britten's Ceremony of Carols and was captivated by the sound of the harp accompaniment, pestering the poor harpist with questions about her instrument and how it was played. When I began to compose, the harp often featured in the music I wrote - as it still does - so it was a particular pleasure to be approached by Catrin (of whose playing I was already an ardent fan) with the suggestion that we might collaborate on a recording. Several themes came immediately to our minds. The harp is the instrument of the angels, and that gave us our first theme. Mark, one of our executive producers, suggested I might make harp transcriptions of two of my short sacred choral pieces, and these - the Gaelic Blessing and The Lord Bless You and Keep You - begin the album. The harp is also the national instrument of Wales, where Catrin has lived for most of her life, and we wanted the album to have a Celtic flavour. Prompted by Catrin's gift of a book of Welsh folk songs, I chose two, Bugeilio'r gwenith gwyn and Migldi magldi, which seemed to call for solo woodwind in partnership with harp. Then our cherished soprano friend and colleague Elin Manahan Thomas suggested another, Beth yw'r haf i mi?, which she loves to sing and asked me to arrange. Elin appears as a most welcome guest artist in this song, and also in a solo version of my Clare Benediction which concludes the album. The Celtic theme received an unexpected boost when Catrin shyly told me she had been working on a "Celtic" concerto for harp and strings. I asked to see it and was instantly delighted with its imagination, variety and colour - I insisted we include it, and feel sure it will join the small and select company of standard harp concertos. Another country strongly associated with the harp is France (where many of the finest harps are still made), and to introduce a French theme my thoughts turned to adapting a rather French-flavoured Suite Antique I composed some years ago for flute, harpsichord and strings. Rewritten for Catrin's harp, it is here reborn as the Suite Lyrique, its six short movements inspired by 18th-century dance and song forms, with just a jazz-tinged waltz to bring us closer to the present. Catrin's busy career as harpist is run alongside her equally busy and demanding one as mother of two small daughters, for whom I wrote the two lullabies that complete the programme. Perhaps some day Ana Gwen and Pegi will be able to play them on the harp. Meanwhile I hope they will enjoy them at bedtime as a prelude to sweet and musical dreams. Lyrics of the songs, provided in the CD booklet, are not reproduced here.